Pelenna Patchworks: Teddy Bears Picnic by Fabric Freedom - perfect for cot quilts! 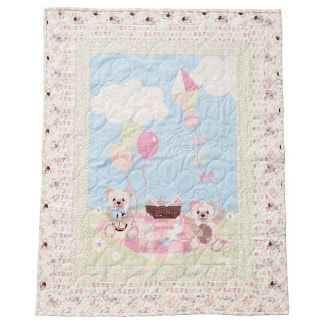 Teddy Bears Picnic by Fabric Freedom - perfect for cot quilts! If you go down to the woods today, you're sure of a big surprise. Meet the teddy bears for their picnic, fly a kite and eat a cake or two! The Teddy Bears Picnic collection by Fabric Freedom is a range of cuddly children's prints featuring picnic baskets brimming with cakes and sandwiches, gingham picnic blankets and daisy coordinates. This fun range of fabrics includes alphabet and number prints alongside ditsy daisy designs, and the muted pastel colours are perfect for a tasteful quilt for the nursery. We have all the fabrics available by the metre, plus a fat quarter pack and a quilt kit for a super quick and easy cot quilt - free instructions can be downloaded here (please note that the fabric codes are incorrect on the pattern, refer to the fabric names only).